Space is not a fun place to get a stomach bug. To ensure drinking water is adequately disinfected, University of Utah chemists developed a two-minute water quality monitoring method that just started six months of tests aboard the International Space Station. "Now they bring water back on the space shuttle and analyze it on the ground. The problem is there is a big delay. You'd like to be able to maintain iodine or silver [disinfectant] levels in real time with an onboard monitor," says Marc Porter, a University of Utah professor of chemistry and chemical engineering. 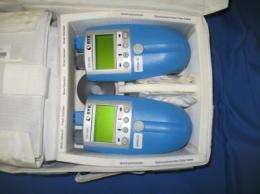 The new method involves sampling space station or space shuttle galley water with syringes, forcing the water through a chemical-imbued disk-shaped membrane, and then reading the color of the membrane with a commercially available, handheld color sensor normally used to measure the color and glossiness of automobile paint. The sensor detects if the drinking water contains enough iodine (used on U.S. spacecraft) or silver (used by the Russians) to kill any microbes. The International Space Station has both kinds of water purification systems. "Our focus was to develop a small, simple, low-cost testing system that uses a handheld device, doesn't consume materials or generate waste, takes minimal astronaut time, is safe and works in microgravity," says Porter. As a spinoff, the test is being modified so it can quickly check water for the level of arsenic - a natural pollutant in places like Bangladesh and the U.S. Southwest and Northeast - and it can be adapted to quickly, inexpensively test for other pollutants. "It is a general method," says Lorraine Siperko, a senior research scientist in Porter's laboratory. "It could be used on the ground for testing all kinds of water contaminants such as arsenic, chromium, cadmium, nickel and other heavy metals." The method is easy to use and much cheaper than existing tests, says Porter. The water-monitoring system fits in a pack the size of a small ice chest. It was launched Aug. 28 on space shuttle Discovery bound for the International Space Station. The project is funded by the National Aeronautics and Space Administration, the Utah Science, Technology and Research (USTAR) economic development initiative and two universities where Porter worked previously: Arizona State and Iowa State. The project team now includes NASA, USTAR and the University of Utah, Iowa State University and Wyle Laboratories. Porter is a professor hired under the USTAR program. During the past decade, the water quality monitoring method was developed and tested during about two dozen low-gravity flights on NASA's "vomit comet" research aircraft such as the KC-135 and C-9, which took off from Ellington Air Force Base in Texas. During a flight, each plane makes 40 parabola-shaped arcs through the sky, climbing steeply, then leveling and diving. Weightless conditions exist for about 30 seconds at the top of each arc. Porter rode the KC-135 twice in 2002 and 2004, and became very motion sick. Siperko rode the C-9 five times in 2006 and 2007, developing and testing the water-quality monitoring technique, including how to remove drinking water samples from collection bags without excessive bubbles, which don't easily separate from water in weightless conditions. The handheld sensor and chemicals used in the testing process also were checked for reliability during the low-gravity plane flights. Now, "the experiment is in space for the first time," Siperko says. "It's very rewarding and exciting to know that something you worked on is so important that NASA put it on the shuttle for a six-month test on the International Space Station." Porter called the space station "the coolest place to do experiments." On the space station, "once per month they will check the water for iodine and silver," Siperko says. "That data will be downloaded and relayed back to Earth, to Johnson Space Center" in Texas. "We have teleconferences with them, and they will transfer the data to us electronically for us to look at," she adds. "That way we can judge if the experiment is working correctly. If any unforeseen problems arise, then we can advise them as to what we think might be the problem and how to correct it." 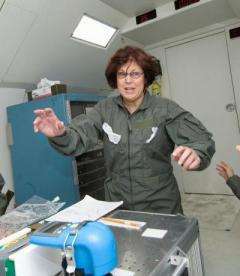 University of Utah chemist Lorraine Siperko experiences weightlessness during a flight aboard a NASA "vomit comet" aircraft. Siperko made several such flights to test a new system designed to monitor drinking water quality aboard spacecraft. The system includes a commercially available color sensor (blue device in foreground) that checks the level of disinfectant in drinking water. The water quality monitoring system was delivered to the International Space Station in August for six months of tests. Credit: NASA. The project began a decade ago, before Porter joined the Utah faculty, when NASA sought proposals for disinfectant or "biocide" monitors to check the safety of drinking water on manned spacecraft. "You can't sterilize water well enough to keep things from growing in it," Porter says. "Nature happens." NASA uses iodine as a disinfectant on U.S. spacecraft. The Russians use colloidal silver - pure silver nanoparticles, some of which go into solution. The problem for both iodine and silver is that microbes grow in the water if levels are too low. If levels are too high, iodine-treated water tastes bad and eventually might cause thyroid problems, and silver at excessive levels can turn the skin grayish blue. Space station water now is sampled and returned to Earth for testing at intervals of months because "they don't have an acceptable onboard technique," Porter says. He says the space station is a proving ground for technologies for longer manned flights to the moon and Mars - even though those flights are unlikely anytime soon due to high costs and other priorities. Water for astronauts is carried into orbit and also produced on the space station as a byproduct of hydrogen and oxygen reacting in fuel cells. Disinfectants or biocides are added during flight, but actual levels in drinking water cannot be tested until samples are brought back to Earth. Porter says required biocide levels in drinking water are 0.1 to 1 part per million silver and 0.1 to 5 parts per million iodine. To test whether drinking water is adequately disinfected, space station astronauts will collect galley water in sealed plastic bags, and then use syringes to remove some water from the bags and push it through a cartridge that contains a half-inch-diameter, polymer, porous-membrane disk impregnated with a chemical to detect either iodine or silver. The disks, known as "solid phase extraction membranes," capture either iodine or silver, depending on the chemical in the disk. Next, the bottom half of the cartridge, which contains the disk, is placed against a German company's handheld "diffuse reflectance spectrometer," which shines light on the disk so it can read the disk's color in about two seconds. Porter says the device was developed to measure the reflectivity or gloss, and thus the quality, of finishes such as automotive paint, industrial surfaces, stainless steel and decorative metals. Each handheld device - two are in the kit taken to the space station - weighs 1.1 pounds, runs on four AA batteries, has a readout screen and measures 7 inches by 3.7 inches by 3.2 inches. To test for iodine, the disk is impregnated with PVP (polyvinylpyrrolidone), a nontoxic chemical in contact lens cleaning solutions. The PVP reacts with iodine, and the intensity of the resulting yellow color reveals the concentration of iodine in the water. To test for silver in water, the disk is imbued with DMABR, which is short for 5-(dimethylaminobenzylidene)rhodanine. A yellowish color indicates silver is absent, while flesh to brighter pink reveals how much silver is present. "We can do this whole analysis in about two minutes on the ground or in space," Porter says. Couldn't they pump their water through a non-metallic pipe, outside of the station, and let the Gamma rays kill the bacteria before the water comes back in? Could something like this work, or do gamma rays not go through water? Maybe the pipe could be clear glass, and the UV from the sun could kill the bacteria...?